No words today. Just resting in the peace, joy and love of Jesus Christ. The wise men of Matthew 2 didn’t just happen to notice the star in the sky and think, Hey, let’s go to Jerusalem today and see if the Messiah’s been born. No, they had been studying and preparing for this time long ago. They weren't called wise just because of their religious training or book smarts - they were wise to know as much as they could and be prepared to seek Him out. And today, wise men still seek Him. Traveling from their homeland by the star to find the Christ child, who at this time is no longer a baby, they headed to the worst possible place: Herod’s palace. With all sincerity, they told the king they were there to worship the Messiah, and suddenly Herod’s world was turned upside down. We're addicted to streusel topping at our house right now. I've put it on everything from French toast casserole to eggnog bread to ... a few things that don't normally have streusel topping. It's just that good. And when I found a cinnamon swirl cake mix on mark-down at the grocery store, the first thing I thought was DONUTS! Aren't donuts what your mind always defaults to? Maybe that's just me. So I prepared the box mix according to the directions (check to see what ingredients you'll need - they vary from brand to brand) and made a batch of 12 donuts. Once the pans are filled, gently press the topping into the batter. This is my go-to topping mix. For a regular-sized donut pan, you'll bake them at 350 for 10-12 minutes. Don't overbake! Let's put reindeer antlers on the Great Dane, they said. It will be great fun, they said. What they didn't say was Great Danes don't particularly like reindeer antlers. They give you the evil eye. They act like you're abusing them. They only pay attention when you're bribing them with treats. And then ... all of a sudden ... they are adorable, well behaved and looking all pretty. For three whole seconds. Thank goodness. Merry Christmas from the Molly Dog! If the shepherds had been home in their beds and not faithfully out in the field with their flocks, they might have missed the whole thing. Luke describes a very pastoral scene, quite typical for the time period. The country shepherds were diligent in their duties, and this responsibility put them exactly where God wanted them to be. This perfectly normal night was about to turn into an experience they would talk about for the rest of their lives. When your only sources of light since the beginning of time have been the sun and a fire, the glory of the Lord shining around them must have rocked their boat. It was a jaw-dropping, sheep-scattering, brain-busting moment that shook them to their core. They weren’t just afraid - they were extremely and severely scared. It’s not every day there are blinding lights and a heavenly visitor at your workplace. Make Christmas morning extra special with an overnight French toast bake. It's so easy to prepare the night before, and all you have to do in the morning is heat it up. This frees you to spend more family time while it bakes. 1. Spray a 9x13 inch baking dish with nonstick spray. Cut bread into 1-inch cubes and transfer to dish. 2. Mix eggs, milk, cream, sugar and vanilla. Pour over bread. 3. Cover with cling wrap and place in refrigerator overnight. 4. Combine topping ingredients in a small bowl, cutting in the butter last. 5. Cover with cling wrap. Place in refrigerator overnight. 6. On Christmas morning, preheat oven to 350 degrees. Sprinkle topping evenly over the bread mixture. Whether you're looking for a last-minute Christmas decoration or a fun craft for the winter, you'll love making these adorable hot glue snowflakes. They're perfect for window dressing, but you'll find lots of other fun uses for them, too. All you need is a page full of line-drawing snowflakes, a hot glue gun and a piece of parchment paper. The snowflake templates can be as simple or as intricate as you want, but start with an easy one. Trust me. All you have to do is trace the lines with hot glue, making sure all the lines connect. Be careful not to touch any part of the glue before it dries, and work slowly to keep the strings of glue to a minimum. If you do end up with those little cobwebs, you can cut them off with scissors when the piece has cooled completely. Jesus didn’t get angry when there was no palace available for Him to be born in. Jesus didn’t become bitter because the barn was all the room spared for Him. Jesus didn’t throw a pity party and angry-cry because He missed His home in heaven. Jesus didn’t complain about the scratchy straw and the animal smells around His manger. Jesus didn’t let jealousy get the best of Him, wondering why other babies were born in better conditions. Jesus didn’t regret His choices and actions for one single moment. If we were the ones writing the Christmas story, we picture a blockbuster movie script with castles and throngs of people and a triumphant entry. His name and face would have been on the front of every newspaper, and trumpets would herald His arrival for all to hear. All of Israel would have bowed the knee and hailed the conquering King in all His glory and might. One of my favorite times in the kitchen at Christmastime is decorating cookies. It takes me back to my childhood, when I was more concerned about getting as much frosting as I could onto each cookie than with making them look beautiful. Now I try to find a balance between the two extremes. These snowflakes are a great example of how to use one color to its full potential. The white sugar cookie, outlined with white icing and topped with white sugar adds a sparkle and shine to a simple treat. 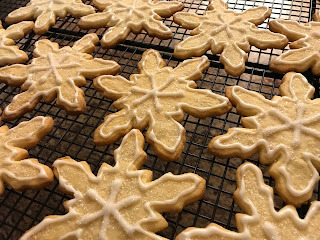 For these cookies, I started with a bagged sugar cookie mix and cut out 16 snowflakes. (I had a little bit of dough left over, so I made a big, shapeless cookie for Danny to decorate and eat.) They’re baked according to the package instructions and allowed to cool completely. ’Tis the season for sending and receiving Christmas cards! I love to read each family’s notes and letters, spending a little time each December learning about all the wonderful things they’ve seen and done in the past year. I also enjoy writing and sending Christmas cards, too. (Truth be told, I also have a stack of New Year’s cards, too. You know, just in case I don’t get everything sent in December.) It’s fun to keep people up to date on what’s happening in our lives and let them know that we’ll be praying for them in the upcoming year. But what do you do with the cards once they’ve been read? Don’t just stack them in a pile! Instead, turn them into part of your home’s Christmas decor. We have three windows that overlook the sunroom, each with a handle to open and close them. They’re right behind our oversized living room chairs, so this is the perfect place for us to hang some holiday cheer. Joseph must have been at a complete loss that day. The girl he was engaged to told him that she was already pregnant, a circumstance that should have ended the relationship altogether. Even in this early stage of their courtship, adultery would have meant public disgrace, but there was compassion in his heart, which whispered in his ear to handle things in private. So there he sat, head in his hands, trying to work through the events of his life and decide where to go from here. He was probably praying for guidance and direction, knowing he couldn’t handle this situation on his own. And when you leave your problem at God’s throne, miracles happen. It was with this heavy on his mind and heart, he fell asleep. It's time to move past the traditional sweet potato casserole with the little marshmallows on top. It's wonderful if that's your family tradition, but let's spread our wings a little this Christmas season and pull out all the stops. This sweet potato casserole features a pecan streusel topping that you'll want to put on everything - I have a little in the refrigerator right now! You can also make this recipe the day before your big meal and heat it for about 50 minutes straight from the fridge. 1. Preheat oven to 350 degrees. Spray a 9x13 baking dish with nonstick spray. 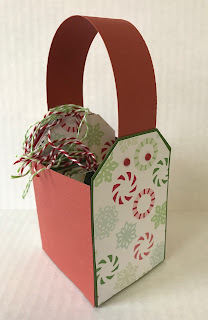 Use some those scraps you have leftover from making Christmas cards to make this Christmas tag gift bag. Yes, I know that rhymes. No, it was not intentional. No, I won't do it again. Gather up card stock, decorator paper, ribbon, brads, tape, double stick tape, a paper cutter and a pair of scissors. Start with two large card stock tags and a coordinating large piece of card stock. Cut two side panels slightly shorter than the tags and however long you want your box to be. This is up to you - mine is approximately as wide as the tags. Then use the same card stock to cut a bottom panel. Tape them all in place. Cut two scraps of decorator paper into tags slightly smaller than the card stock tags and attach them to the ends. Cut a long strip of card stock for the handle. Cut it to length and attach each end with two coordinating brads. The angel Gabriel told Mary that her cousin Elisabeth was also expecting a child, conceived in her old age just as she was promised. Knowing this was a blessing from the Lord, Mary wanted to see her cousin, the one woman who would understand what Mary was going through. So off she went to the hill country. Entering the house, Mary called out to Elisabeth, and Luke paints a beautiful picture of her welcome. Prior to the coming of the Comforter in the book of Acts, people of Bible times were only given the Holy Spirit as a precious gift when in the presence of the Lord. This was the experience Elisabeth was having, though heightened beyond our wildest imaginations. The verse says she only heard Mary’s voice, not even seen her yet, but that sound had a profound effect on her life forever. Why bake a boring old pie for Christmas dinner when you can put together a fun and festive pie that will make everyone smile before they devour it? And the answer is...you shouldn't. Not when you can just pull out some Christmas cookie cutters - which you probably have out already, if you're in the spirit of holiday baking like I am. Choose a few large designs and a handful of smaller cutters in your favorite shapes. It doesn't matter if you make your own crust or use the boxed crusts, as they will both work just as well. Put the bottom one in your pie dish and fill it as normal. Then comes the fun part! Roll out the second crust on a floured work surface and go to town with your cookie cutters. I was able to get nine large shapes and many small ones out of one crust before having to re-roll it. Re-rolling doesn't work great, though, so get as many as you can the first time. If you're like me, you have many more Christmas decorations than you have room on the tree. Don't pack them away or get rid of them - use them to create a one-of-a-kind wreath using a picture frame! Any kind of ornaments and embellishments will work here. Mine is a combination of traditional balls and a couple of sparkly decorations from the dollar store. I used them to create Christmas denim pocket ornaments last year, but I had almost-full boxes of them left over. Apparently it was for just this opportunity. Find some pretty ribbon to attach them to the frame. Mine here is wired and glittered. There's no better combination. Ornaments can be attached simply by tying them on. I used large glue dots for the others and to attach the ribbon to the top of the frame. * tie the ribbon around the top of the frame and add a bow to each one. 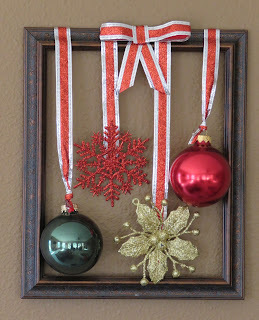 * use a much larger frame to use more ornaments. * spray paint the frame and use some fun finishing techniques. Less than a year before the arrival of the Christ child, we see another visit from Gabriel and this time to an unsuspecting young girl. The angel must have been a commanding figure, as his appearance struck fear in the hearts of both Zacharias and Mary. But both times Gabriel tells them there is nothing to fear because he is on a mission from God Himself. How jaw-dropping it must have been for Mary to hear such powerful words spoken about her from the lips of God’s angel. We can tell that she doesn’t think of herself in those terms because her only response is: But how? This amazing stuffing recipe will be the perfect addition to your Christmas table this year. It takes a little bit of prep work to get it ready, but it's totally worth the effort. Make this dish up ahead of time, then cover with cling wrap and leave it in the refrigerator overnight. On Christmas Day all you'll need to do is put it in the oven and heat it up! 2. In a large cast iron skillet, thoroughly brown the sausage. 3. Add onion, celery and garlic, cooking until all are slightly soft. 4. Stir in apple, then the stuffing mix. 5. Once heated through, slowly add the chicken broth and stir to combine. Putting together some Christmas gifts for friends and family? Add these hot cocoa gift bags to the list, and you'll be the hit of the party. Your recipients will love your "sweet" present, and they'll think of your kindness again when they get home and make their special treat. 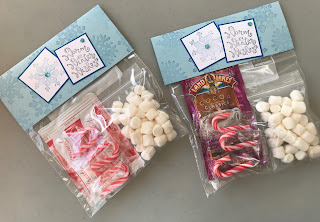 You won't even need that many supplies - two sizes of plastic bags, paper, stamps and ink, hot cocoa mix, marshmallows and some mini candy canes. You can get several kits out of each item, and you can even personalize them for the recipients! Start by filling the larger bag with a hot cocoa package, a small bag of marshmallows and a handful of candy canes. Cut a piece of card stock that will fold down to the tops of the items inside. This covers the empty space at the top of the bag and gives you more space to stamp. Today we meet three people we never see in a nativity scene, but who had incredibly important parts to play in the Christmas story. More than a year and a half before the birth of Christ, Mary's cousin Elizabeth and her husband Zacharias were living lives completely devoted to the Lord. Luke describes them with words like righteous, walking and blameless. The only thing missing was a child. Then, on one ordinary-turned-extraordinary day, the angel Gabriel came to the temple to speak with Zacharias while he was performing his priestly duties. In the midst of the everyday, his life would change forever, as would yours and mine. This godly couple would receive a son, who would bring them joy in such a special way. But what does this have to do with Christmas and the birth of Christ? The angel's explanation makes the connection crystal clear.